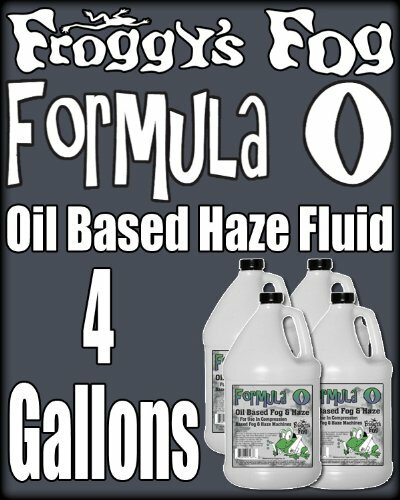 TR20 - Froggys Formula O - Pro Oil Based Haze Juice Machine Fluid is a non-toxic solution that produces a long lasting, low moisture haze. Formula O is colorless, odorless, non-flammable. All of our fluids comply with the strictest health and safety regulations, and are formulated to extend the life-span of your hazer. Oil-Based Hazers produce the perfect haze for enhancing lighting for theatrical, stage and live performance applications. It is far more persistent than water based haze and should reduce your fluid consumption. Our Formula O Oil Based Haze is made from the highest quality pharmaceutical grade oil and stabilizers so you can be confident it will be compatible with your Oil Based Hazer. When used with special Oil Based Fog Machines, the smoke produced by Froggys Formula O - Pro Oil Fluid is extremely resistant to high temperatures creating the perfect smoke for Fire and Rescue Training. Other applications for Froggys Formula O include hot smoke tests in atriums, hangars and warehouse environments. Formula O is also equipped with durability ideal for applications requiring very large volumes of fog such as, road tunnel and building pressurization testing.